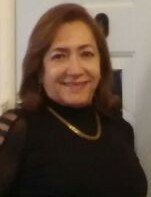 Sonia R. Roman, 56, of Jersey City, passed away on Friday October 13th 2017 at home. Born in Medellin, Columbia, Sonia moved to the United States in 2014 in search of a better life, where she met the love of her life, whom she married in 2015. Sonia was full of life, with a heart of gold, and was loved by all whose lives she came across. Sonia was predeceased by her mother, Solina Lopez. She leaves behind to cherish her memory her Papa, Javier Rojas, her husband Jose Roman, sisters Flor, Nohelia and Dora Rojas, and brothers Edgar, Oswal, and Reimar Rojas, as well as many in-laws. Relatives & friends are invited to attend the funeral on Monday, October 16, 2017 at 8:30 am at Plaza Funeral Home. Mass of Christian burial will be celebrated at 9:30 am at St. Joseph’s Church, Jersey City, with Interment to follow at Fairview Cemetery, Fairview, NJ. Visiting Sunday, October 15, 2017 2:00 -4:00pm and 7:00-9:00pm at Plaza Fneral Home.